What great memories! I was fortunate to have seen all these performances (or at least the tours at some point) and can tell you from the outset that these are must haves for all space rockers. The sound quality is excellent on all three, and the performances are exactly what you would expect from these musicians. I got to see Harvey Bainbridge twice last year. Once at Strange Daze and also the week before right here in Columbus, Ohio when Quarkspace hosted him as part of the Traveling Outerspace Spectacular that Jim Lascko had organized leading up to the Strange Daze festival itself. Seeing Harvey perform in a small club, and backed by the cosmic wonder that is the Solar Fire Lightshow was a treat. 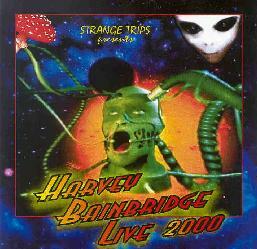 The "SD Intro" opens the Harvey set, a 9 minute free verse introduction by Strange Daze M.C. extraordinaire Thom The World Poet. Harvey then launches into "Black Hole", and from there on shows himself to be a top notch creator of cosmic electronic space music. Harvey's performance is something beyond much of what's typically heard in the electronic space genre because we're also treated to his intense spoken word/monolog style vocals which guide listeners through the realms created by his music. Seeing him perform in a club was great for a closeup intimate performance, but watching and listening under the night sky at Nelson Ledges Quarry State Park where Strange Daze is held was mighty special too. Anubian Lights are Tommy Grenas and Len Del Rio from Farflung and Pressurehed, Anubian Lights being a project that plays Egyptian inspired electronica. The duo played a set prior to Farflung at Strange Daze, but this performance was recorded at a small club in Cleveland called the Symposium. The trance inducing grooves you've heard on their CDs is highlighted as we travel through electronic realms that incorporate ethnic influences along with elements of hip-hop and ambient space. Like Tangerine Dream meets The Orb in the shadow of the pyramids. "As Seen In 822 A.D." and "The Fire Breathes" go deep into what sounds more like Indian influences with chanting samples in what I'd guess is either Arabic or Hindi, and a dancey but mucho freaky electronic groove. And we're treated to some always welcome Gilli Smythe space whispers on "One Eye To The Sky". 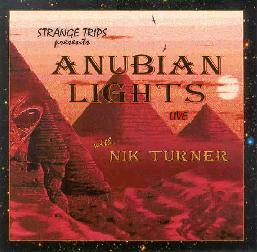 Anubian Lights' set preceded Farflung's at the festival and this disc includes Nik joining the band for "D-Rider" and a 17-minute "Soul Herder", which was actually the beginning of Farflung's set. But hey, you're probably going to pick up this and the Farflung disc so you're all set. 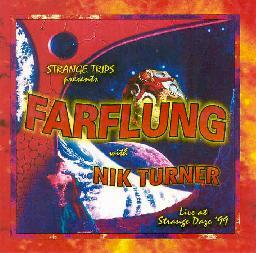 The Farflung set from Strange Daze '99 is KILLER in-yer-face rockin' Farflung. These guys are among space rock's very BEST. They rock hard and trip out, drawing on their many many influences. These guys are into so much different music that they've had to form numerous side projects... Anubian Lights, The Brain, Zero Gravity, etc. There are 10 tracks on this set, 5 Farflung themselves and 5 with Nik. Farflung fans who haven't been able to secure a copy of the apparently hard to find The Belief Module, and the yet to be released Myth Of Solid Ground, should note that tracks from each of these discs are in the Farflung set. And there are some great jam sections in which each instrument is crystal clear. The sound is very very good. The tunes with Nik include "Sonic Attack", "Brainstorm", "Watching The Grass Grow", "Opa-Loka 2000", and "You Shouldn't Do That". For more information you can visit the Strange Trips web site at: http://www.strange-trips.com. U.S. buyers can order them by sending $10 + $2 S&H for each CD to: Strange Trips 4485 W. 130 Cleveland, Ohio 44135. In England and Europe they are available from Andy Garibaldi at CD Services: http://dialspace.dial.pipex.com/andygee/index.htm.